You don’t have to go to the U.K.: This 60-pound wheel of bandage-wrapped farmstead Cheddar was made in California by Fiscalini Farmstead. Voted voted “Best Farmhouse Cheese” at the 2002 American Cheese Society Awards, it gets our vote, too. This is Page 1 of a three-page article. Click on the black links to view other pages. Today, Cheddar ranks as one of the most popular cheeses in the world. Just within the U.S., some sources claim that almost 90% of all cheese sold is some type of Cheddar. Certainly, it is the cheese for which England is best known. Let’s take a closer look. Cheddar is an ancient cheese. * Supposedly, the cheese takes its name from either the village of Cheddar in Somerset or some nearby caves, which were called the Cheddar Gorge Caves (or simply the Cheddar Caves). Cheddar was known as far back as the twelfth century. 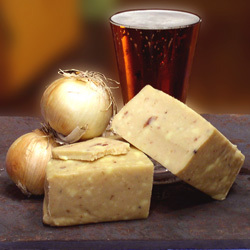 In 1170, Henry II declared Cheddar the best cheese in England and purchased over five tons of it. Cheddar seems to have been equally admired by his son, Prince John, who purchased a similar quantity in 1184 (presumably, both men shared all that cheese with others). Five hundred years later, by the reign of Charles I (1625), demand for Cheddar was so great that it was often sold even before it was made. Queen Victoria was presented with a mammoth Cheddar during her reign, weighing in at over 1200 pounds. As is the case with many other foods, including chocolate, Cheddar gradually became less expensive and more widely available. Today, it can be bought in every supermarket as well as in specialty food stores and cheese shops. But there are Cheddars and there are Cheddars, and the supermarket variety bears little resemblance to what was once a cheese beloved of kings. The biggest reason for that? *Editor’s Note: Yet, the story of cheese is far more ancient than Cheddar. Read the History Of Cheese. 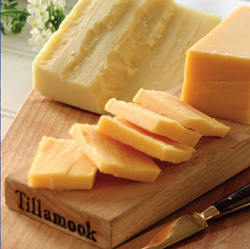 White and yellow Cheddars from Oregon’s Tillamook County Creamery, a great American Cheddar producer. Cheddar is a cheese distinguished by process, not place. The name “Cheddar” is not protected, as are some other names in the food world, so Cheddar can be made literally anywhere, by anyone. That can result in better availability and less cost, but both frequently come at a price (that is to say, a lesser cheese comes at a lower price). Traditional raw milk Cheddar can be hard to find these days, and the industrial stuff turned out so inexpensively doesn’t deserve the Cheddar name. Sadly, that’s the only type many people know. Cheddar originally began as a raw milk cheese because, of course, pasteurization was unknown until long after Cheddar had been formulated. 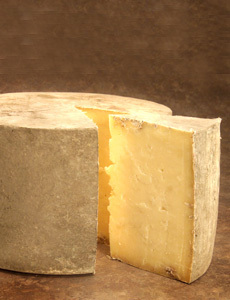 Historically, Cheddar has been a cows’ milk cheese (these days, some companies make a goat’s milk “Cheddar,” however). As is the case with other types of cheese, the milk is initially heated, then starter culture is added, followed by rennet. If coloring is to be added, this is done after the starter culture is in, but before the addition of the rennet. Typical sources of coloring for Cheddar are annatto and carotene. If your Cheddar is vivid yellow or orange, coloring has likely been added. Once the curd has reached the correct degree of firmness, it is cut into small pieces, either by machine or by hand. This process helps release the whey from the curds. The process of making traditional Cheddar, however, continues with “pitching,” allowing the curds to settle to the bottom of the cheesemaking vat, then draining off as much of the whey as possible. When the drained curds have coagulated into one mass, they’re cut into slices which are stacked atop one another into flattened piles, then turned several times. This is “Cheddaring,” the procedure from which the cheese takes its name, and it changes the texture of the curd. The Cheddared curds are “milled,” or cut into small pieces, then salted and stirred well. Finally, they are placed into molds or hoops (a hoop is a cheese mold without a fused bottom), and pressed gradually so any whey remaining drains away slowly. Most definitely “pitched” and “Cheddared,” this English Cheddar with caramelized onions, from the historic Wensleydale Creamery in England, made waves at the Fancy Food Show last summer. Versatile and addictive, it enlivens everything from sandwiches and hot dogs to grilled portabellas. More information.